We had a camp cook! 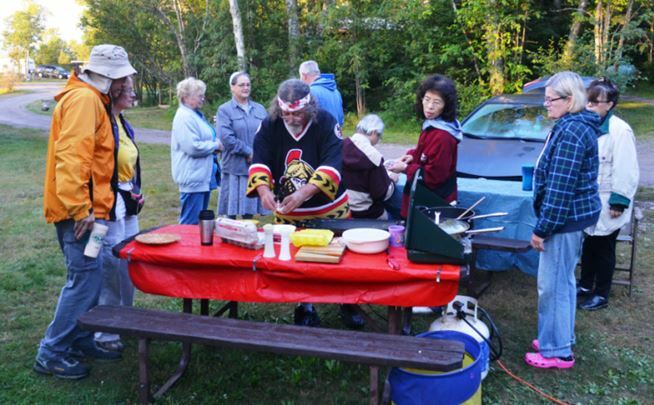 John Anderson, here displaying his loyalty for the Ottawa Senators, cooks breakfast at Rossport Provincial Park campsite. For the five nights we camped in two Ontario parks John cooked breakfast and dinner for all 15 of us while his wife Patti went rockhounding. He even found time to make us sandwiches for lunch. John claims he awoke at 4:30 to make sandwiches and prep for breakfast, but none of us actually know if this is true! BUT, coffee was always ready at 6:30 and eggs or pancakes soon followed. The NPGS portion of the trip included five plus days and more than fifteen great sites from Sault Ste. Marie, Ontario to just west of Thunder Bay. 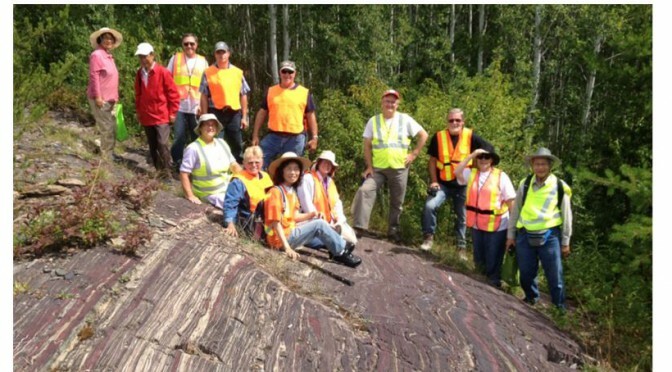 Amethyst in Thunder Bay was the highlight, but we collected fluorite at two locations, silver at another, Mary Ellen jasper, banded iron formation (see featured image), and all sorts of neat rocks at wonderful Lake Superior stone beachs. 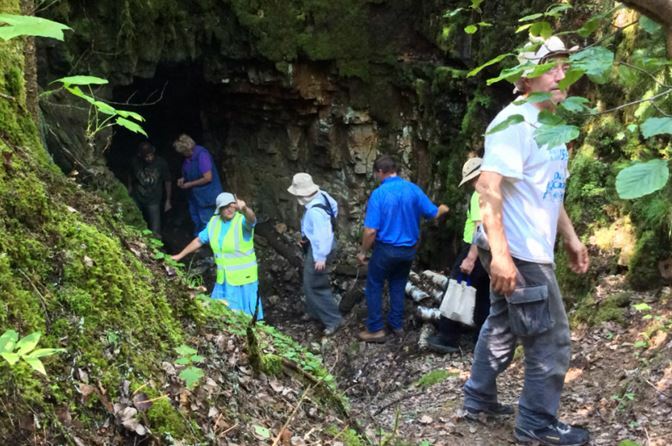 We were led to an old mine site by Jerry White of the Ontario Geological Society where we even found visible gold. Matt Weiler found a piece with both gold and brightly fluorescent scheelite. Matt Weiler had an interesting week. He made friends with an inuksuk, one of literally thousands we saw atop the roadcuts along the Trans Canadian Highway. The person-like stone cairns are used by the Inuit and other arctic peoples to mark trails, offer greeting, or in cases like this, just to indicate “someone was there”. 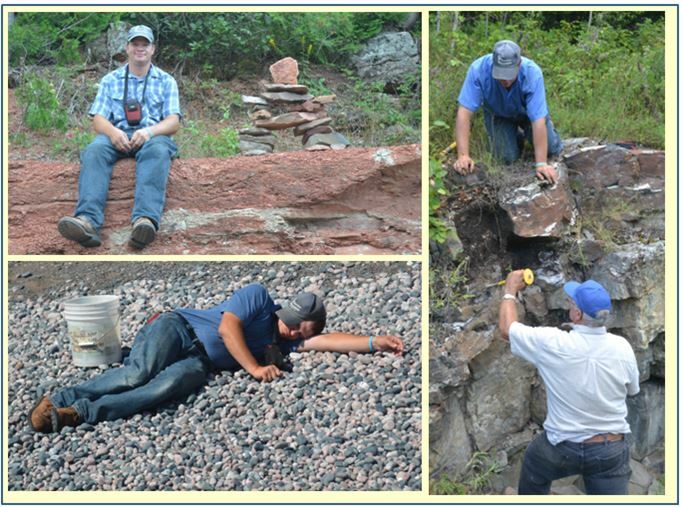 At Jackfish beach, Matt took a nap on a bed of stones. Perhaps he knew that this dad would need serious help extracting a quartz lined vug from a roadcut near Kakabeka Falls in the days ahead. WCGMC members took our time getting to and from Sault Ste. Marie adding several stops along a northern route through Sudbury, Ontario on the way and in Michigan (yes Petoskey stones) on the way home. There is way to much to report on in one note in one newsletter so you can expect to see stories and pictures from the trip throughout the winter. What a trip: 2800 miles (or is it 4600 kilometers!). Red stops were planned by Niagara Peninsular Geol. Soc. 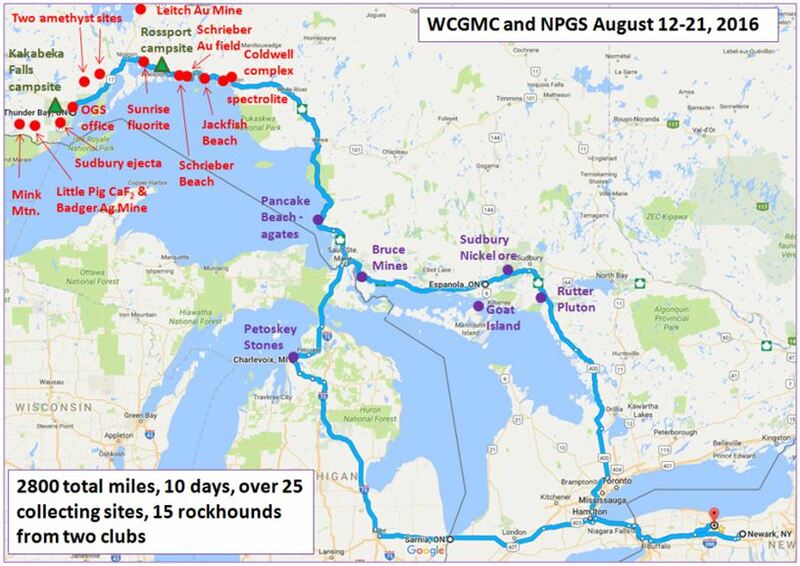 WCGMC made stops in blue on Ontario route to Sault Ste. Marie where we met the NPGS and on the Michigan route on the way home. We did see three live black bears along the roadside one our trip, but none stuck around for a group photo or for that matter a mug shot. This guy did, however, and on the way home we got a group picture. 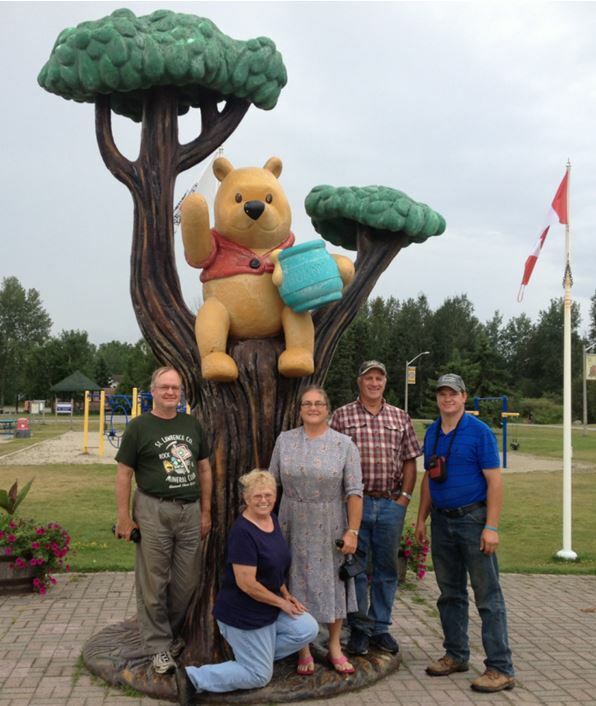 If you wonder why Winnie the Pooh, stories written by British author A.A. Milne, is immortalized by this “statue” in Little River, Ontario, well, go look it up!